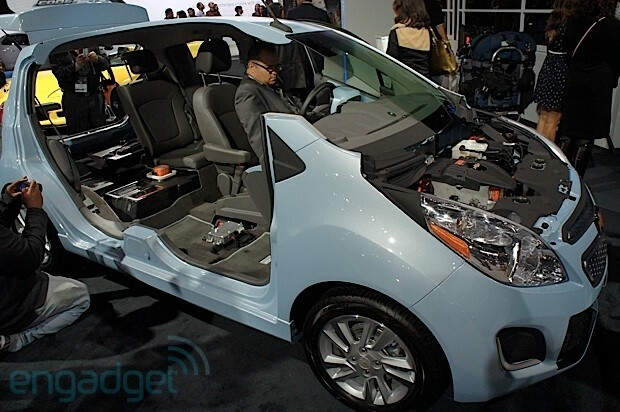 Details of Chevy's first all-electric car, the Spark EV, hit the web yesterday, and today the diminutive car got its official unveiling at the LA Auto Show. Since we're here in SoCal, we figured we'd bring you some shots of GM's latest electrical offering, and Chevrolet was kind enough to cut apart a Spark for us to see its innards. Head on down to our gallery below, where you'll find the 130hp electron-powered motor, 20kWH battery pack, and MyLink-equipped infotainment system displayed in all their glory. Mark Hearn contributed to this post.